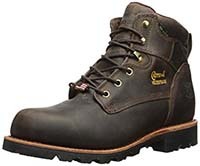 While most guys know to bundle up when they head off to work in the winter months, it’s not uncommon to see a lack of adequate protection on the feet. Whether you work outdoors in the snow or in the confines of a closed and refrigerated space, you need to keep your feet protected from the cold. Cold weather isn’t just uncomfortable. It can be dangerous too. Failure to keep your feet warm and insulated can lead to a host of problems. Not only can you experience health issues ranging from a simple cold to hypothermia, but you’ll quickly feel the effects of low temperatures on your feet and in your bones. 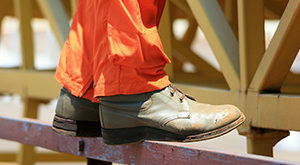 In fact, poor foot protection can ultimately lead to poor work performance. To avoid these issues, you need to invest in a warm pair of work boots. They should have adequate insulation to keep you warm and a bevy of features to ensure that you stay safe. 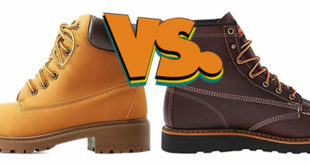 Here are 7 of the best insulated work boots to combat the cold. These boots contain 400 grams of insulation, ensuring that you stay cold in standard winter environments. This insulation is actually Thinsulate by 3M, so it provides high levels of protection without the added bulk. The uppers are made from durable Nubuck leather. It’s directly attached to the rubber and polyurethane outsole for a tight seal. Inside, there’s a removable cushioned footbed and a moisture-wicking mesh lining to keep you dry throughout the day. There’s also a lightweight nylon shank built into the sole to add strength, support, and rigidity. The boots also feature a lace closure system and a padded collar for comfort. With a high shaft that measures 7 inches high from the arch, these boots can keep more of your legs protected from the harsh cold. They’re made from waterproof leather that’s also resistant to abrasive damage. 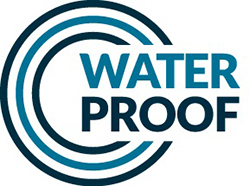 For further protection from water penetration, boots utilize a waterproof membrane. There’s also a layer of breathable liner to keep your feet dry. Surrounding the liner is 400-gram insulation. The footbed is also designed to provide you with support and comfort. The outsole is made from rubber and designed to prevent slipping. A sizable alloy toy cap can protect you from crushing injuries while giving your toes room to move. These boots from Wolverine have a spacious slip-on design for easy removal. The uppers are made from full grain leather. This material is waterproof and very durable to protect you from the hazards of the work environment. Inside, the boots have 200-gram insulation to keep you warm. It’s suitable for normal winter environments if you stay active. It also has a unique MultiShox footbed that absorbs the force of impact with every step to ensure that your feet are comfortable as you work. A prominent midsole helps to support your arches as well. The outsole is made from rubber. 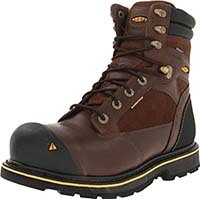 From Chippewa is this pair of quality winter work boots. They’re made from top-grain leather for the best in durability and water protection. 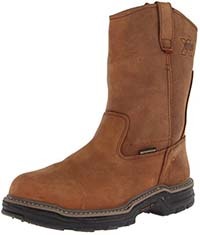 The boots have a standard 6-inch shaft and a padded collar for comfort. Inside, the boots utilize 400-gram Thinsulate insulation. There’s also a removable waterproof bootie and an additional Dri-Lex waterproof lining. 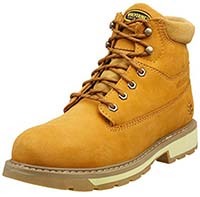 To add further protection, the boots use Goodyear welt construction. To support your feet throughout the day, the boots include a removable orthotic insert, a waterproof insole that also absorbs shock, and a triple-ribbed shank built directly into the synthetic outsole. These boots are uniquely designed to protect you from whatever work throws at you. The uppers are made from Nubuck leather. They have a 7.5-inch shaft to provide protection beyond your ankle. There’s also a composite toe cap. 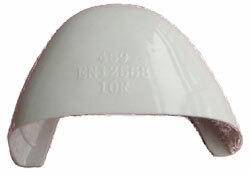 The caps have an asymmetrical design that provides a better fit for your toes and better protection from accidents. To keep you dry, the boots have a waterproof membrane. It’s also breathable to help manage sweat. The outsoles are made from an absorbent synthetic material and have a polyurethane shank built into the middle to provide support. 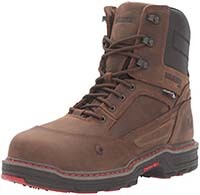 Another great option from Wolverine, these boots are built to keep you warm from more extreme temperatures. It has 600-gram insulation inside. There’s also a comfortable OrthoLite footbed that’s easy to remove for maintenance. A polyurethane midsole and nylon shank add further support throughout your foot for all-day comfort. There’s a number of features to keep you dry. They include a mesh lining that wicks away moisture, a full-grain upper that repels water, and welt construction for the outsole to create a tight seal. The outsoles are made from rubber and are designed to be slip, oil, and abrasion-resistant. 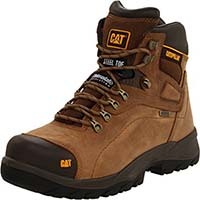 These boots from Caterpillar are designed to support your feet naturally as you walk. The footbed is anatomically contoured and features adequate padding and support features to keep your feet stable. In terms of winter protection, the boots have 200-gram insulation. There’s also a breathable liner to help you control sweat. The outsole is made from rubber and features a steel shank inside. Additional features include a removable EVA insole to cushion the impact on your feet, a steel toe for protection, a full lace closure system to get a snug fit, and a 6-inch shaft with a padded collar. While standard work boots may be fine for moderate temperatures, there’s a lot to consider when you’re exposed to colder environments. 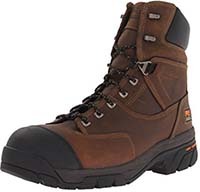 Many manufacturers have boots that are specifically designed to keep you safe, warm, and comfortable in cooler environments. They contain a number of unique features that will prove to be beneficial. 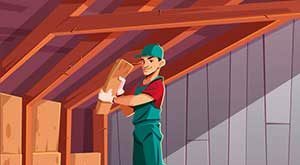 Insulation is a must-have feature whenever you’re working around snow and freezing temperatures. Essentially, insulation acts as a protective barrier. It helps to prevent the cold air from getting into the boots. Not only that, but it also helps to keep the generated body heat from getting out. Boots will incorporate insulation in the lining to act like a jacket for your feet. Manufacturers create boots with a variety of different insulation levels. Insulation is measured by its weight in grams. The higher the weight in grams, the thicker and denser the insulation is. As a result, it will perform better to keep you protected longer. Weights typically range from 200 grams up to 1,000 grams or more. The specific level of insulation you need will depend on your work environment. This amount of insulation is great for standard winter environments. It provides enough insulation to keep you warm in temperatures ranging from 30 to 50 degrees Fahrenheit. As you move, you’ll generate body heat that will emit from your feet. This heat is more than enough to keep you comfortable throughout the day. If you’re working in typical winter temperatures between 30 and 50 degrees but don’t do a lot of moving, this insulation level is great. Because you’re not walking around, you’ll generate less heat. This bump in thickness and density will keep you warm for much longer. 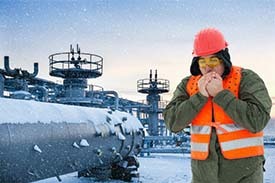 This level is ideal for extreme temperatures below 30 degrees. Boots with this insulation will help to keep you safe from the effects of the cold. Anything less will only provide protection for a short amount of time. Waterproof boots can help you avoid getting sick. A common issue that plagues those that work in the snow is trench foot, which happens when the skin is exposed to wet and cold conditions. It can be painful and lead to a host of health concerns. To avoid it, go with boots that are sealed and protected. Welt construction will ensure that melted snow can’t make its way between the seams of the boot uppers and outsoles. Additionally, quality materials on the upper like leather will prevent moisture from seeping in. Boots should also have a moisture-wicking liner. Sweat can be just as bad as melted snow during the winter time. A high-quality liner will help to keep you dry inside while a solid boot construction can help prevent water penetration from the outside. Snow, whether it’s already melted or not, can be very slippery. Walking on snow can lead to painful slip and fall accidents. 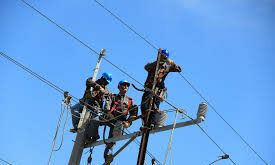 If you happen to be carrying tools or equipment, that accident can get even worse. To prevent this, take a look at the outsoles. 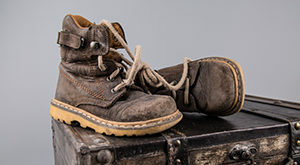 The bottom of the boots should contain a special slip-resistant design that improves traction. Designs typically work by redirecting water away from the sole and breaking through the slippery substance so that the sole can make contact. For even more protection, go with boots that are also resistant to oil. Steel toe caps, metatarsal guards, and puncture plates are all great things to have. They can keep your feet safe from sharp debris and injury from large objects. With that being said, it’s important that you go with guards that are made from a composite material. There’s nothing worse than feeling the cold inside your shoes because of metal. Steel toe caps and guards will transfer the outside temperature, essentially rendering any insulation useless. Shank supports can help to improve your stability on the snow. They’re built directly into the outsole and make the boot rigid for support. Like with toe caps and guards, it’s a good idea to go with shanks that aren’t made from metal. Nylon or fiberglass shanks are the way to go because they don’t transfer temperature and are very lightweight. With a pair of great insulated work boots, cold weather won’t be an issue. They’ll keep you safe and protected regardless of the harsh environment you’re in. Instead of being focused on that cold tingling feeling seeping into your boots, you can stay warm and focus on the job at hand.